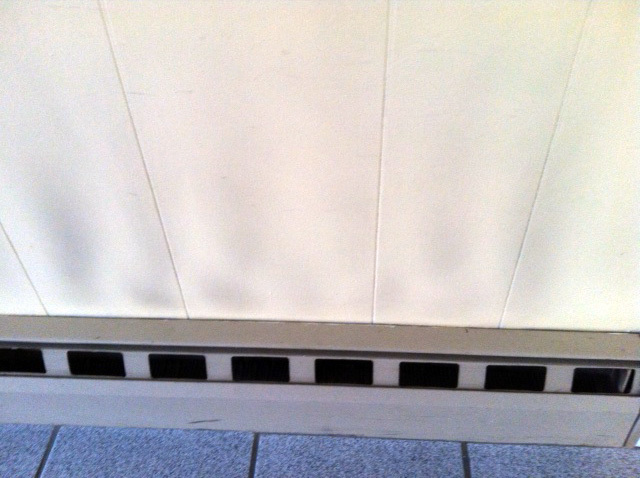 We recently received a call from a long-time Levittown customer in North Park that was concerned about black marks on the walls above his baseboard heaters. This is referred to as ghosting or thermal tracking, which is a relatively common phenomenon that plagues both old and new construction. Here’s a look into the causes and some things you can do to prevent it. 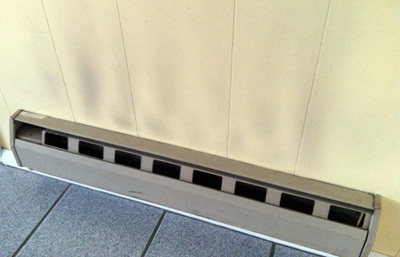 The dirty streaks that can appear above your baseboard are mostly created by dirt, dust or carbon soot from a number of sources like fireplaces, cigarette smoke, pets, cooking byproducts, etc. that are spread by the natural convection created by the heating cycle. 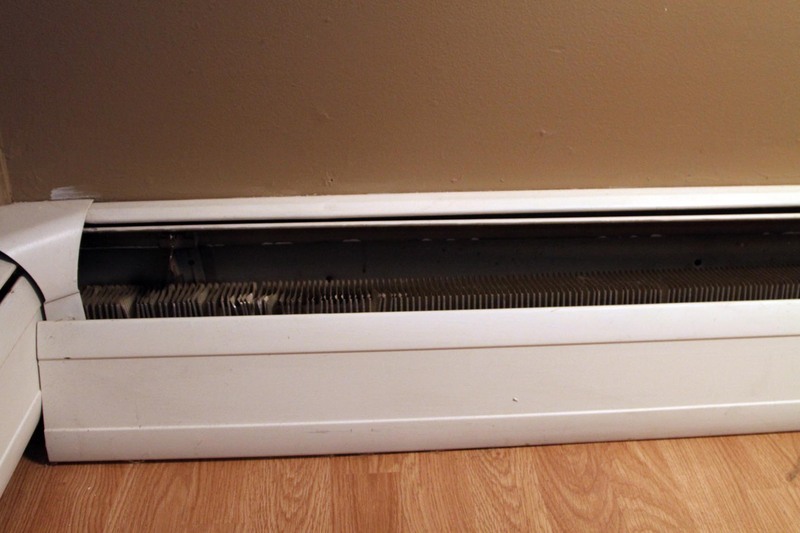 If the warm, dirty air from the baseboard heater comes in contact with a cool wall or one with a higher moisture concentration the dusty particles are deposited. 1. 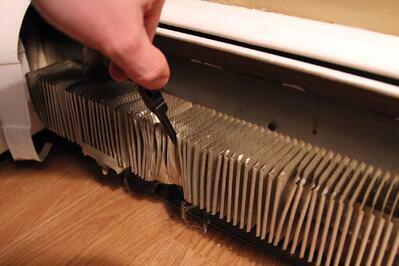 Turn off the power to your heater and remove its cover once you’re sure the heating element has cooled. Some covers lift right off, but others may require loosening a few screws or caps. 2. 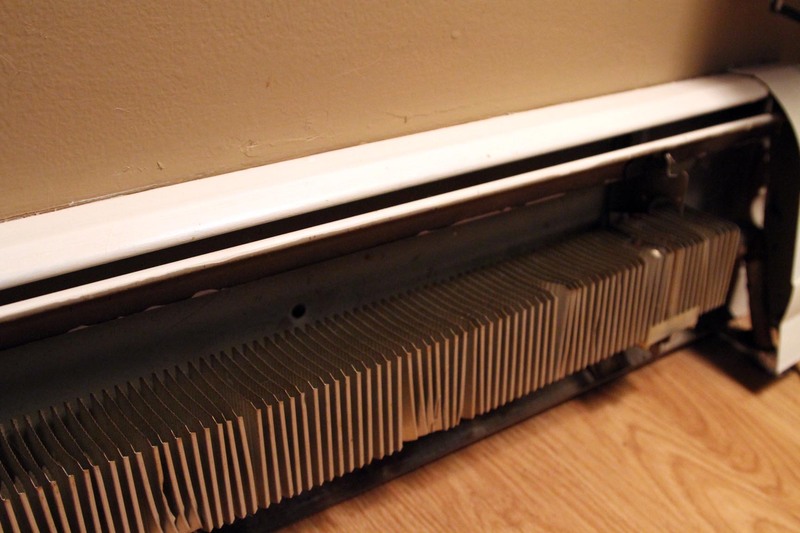 Remove any large pieces of debris from in between the aluminum heating fins that may be too big or stuck to vacuum up. 3. Gently vacuum in the inside of the heater using a soft brush attachment, being careful not to damage or bend any of the heater fins. 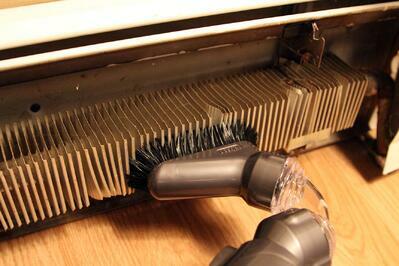 If there is any additional debris that the vacuum cannot reach simply use a soft paintbrush to remove it. 4. If you have any excess dust on the surface of the fins use a soft cloth to remove it and straighten any fins that were bent in the previous step with a pair of needle-nose pliers. 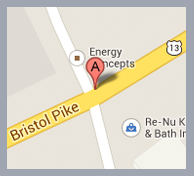 Paul Giorgi, our BPI certified building analyst, would also remind us that this is also an air sealing and insulating opportunity that can make your home more efficient and save you money in the long run. In the home performance biz, ghosting can also be a tell-tale sign that the walls are significantly colder than the rest of the house. On exterior wall assemblies, lack of proper air sealing and insulation is the main culprit. On interior wall assemblies those open to attic spaces can have cold air currents traveling through these assemblies. This is called convective looping and can also contribute to this circumstance. Proper air sealing in the attic is the way best to mitigate this problem. So, not only are these marks unsightly, but they are a symptom that your house is not performing as well as it should be. It is very likely that the problems that cause these thermal streaks are also contributing to higher heating and cooling costs as well and might be contributing to comfort issue’s in the home. With a little elbow grease and proper insulation you can prevent these unattractive marks from your walls or floors and make your home more efficient in the process. You may also want to consider arranging the furniture in your room so that dirt and dust is not directed toward your heater. If you'd like to know how efficient your home is, click the button below to learn more about getting a home energy assessment and how it can help you save money on overall energy costs.